Pangolins, also sometimes called scaly anteaters, are strange looking creatures covered with protective horny, overlapping scales. It is estimated that the Southern African Pangolin has been around for over 40 million years, adapting itself to the changing environment in order to survive. 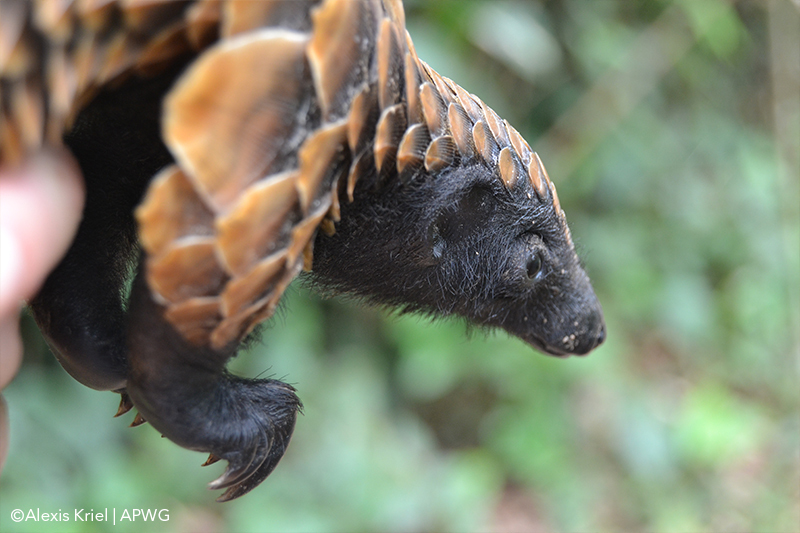 There are eight pangolin species in total with four endemic to the African Continent. Pangolins are in no way related to armadillos! In contrast to the Giant Ground Pangolin the Black Bellied Pangolin is the smallest and lightest of the African Pangolins and some might say the most beautiful too. Weighing in at around 3kgs and a tail that long, slender and longer than its body. 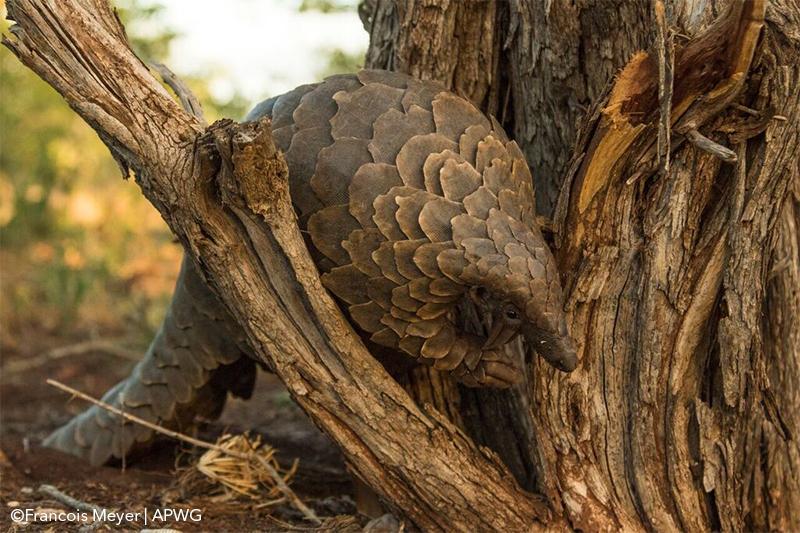 The Black-Bellied Pangolin spends its life in the trees. It is also a diurnal (as opposed to nocturnal) species occupying the swamp forests of Central and East Africa. The scales of this species tend to be darker, ochre in colour and larger than the others with very dark borders. The Black-Bellied Pangolin is similar to the White-Bellied in size and the ratio of body to tail dimensions and is also arboreal. the scales are lighter in colour (being nearer to grey) and have three distinct points at the tip – thus the tricuspis moniker in the species name. 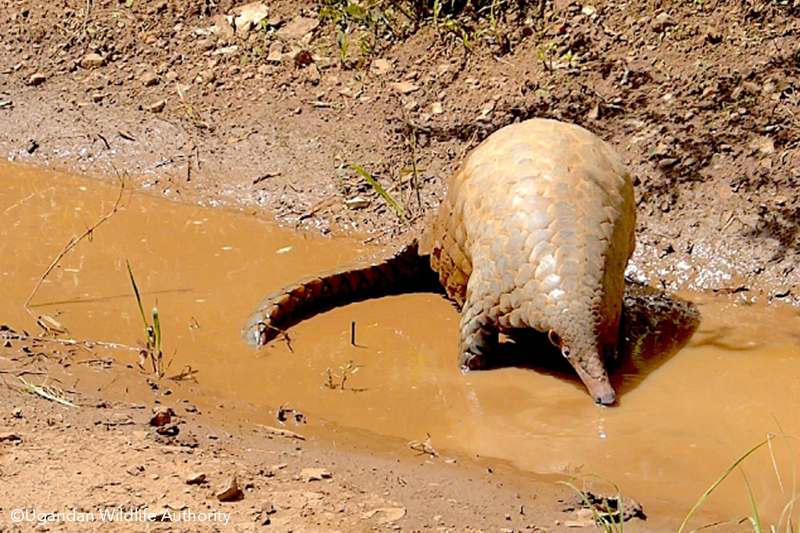 Endemic to Central and East Africa the White-Bellied pangolin is thought to be in greater numbers and is more readily encountered than the Black-Bellied. This might also be due to its propensity to forage on the forest floor as well as in the trees. They have a small head and a long, broad tail and is probably the most widespread of all the African pangolin species. They have been recorded in Southern Africa, through East Africa and as far North of South Sudan and Chad. This is the second largest species growing to around 1.2m long and 20kgs but this varies depending on the environment that individuals inhabit with smaller animals found in semi-arid areas. Pangolins feed mostly on ants and termites, which are gathered up either from the ground or in the trees. Termite nests provide larger and more concentrated sources of food. Pangolins can also dig insects from mounds with their claws. Because they are toothless, they use their extremely long tongues (up to 16 inches in the larger species) to collect their prey. Large salivary glands coat the long tongue with a gummy mucus to which ants and termites stick. Their stomach is also specially adapted for grinding food. This process is helped along by the small stones and sand pangolins consume. Pangolins have a gestation period of around 100-140 days depending on the species and generally give birth to one “pup” although twins have been recorded. For protection, pangolins rely on their ability to roll themselves into a ball. This is done successfully for protection in the wild since it takes considerable force to unroll them. The cutting action of their armour-plated scales, worked by powerful muscles, protect them, too, by inflicting serious wounds on anything inserted between them. Leopards and other large animals, such as hyenas, occasionally prey on pangolins, but they are obviously well-protected from its predators. 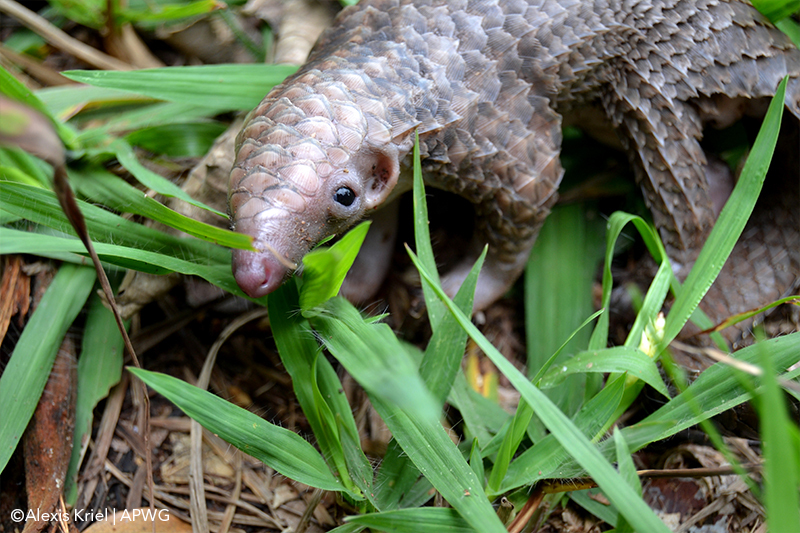 These mechanisms are, however, not adequate protection against man and pangolins now are reported to be the most trafficked animal in the world. Their scales and body parts are revered in Eastern Medicine and their meat regarded as a delicacy.